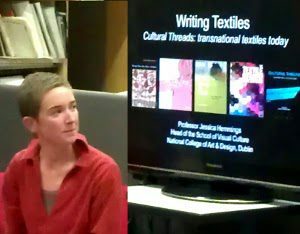 The November 2014 Clothes Cloth & Culture Group meeting was a panel discussion to mark the publication of ‘Cultural Threads: transnational textiles today’. 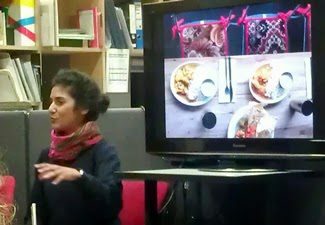 The panel consisted of the editor Dr. Jessica Hemmings, contributors to the book and the featured artists and designers : Dr. Christine Checinska, Sarah Rhodes and Jasleen Kaur. Curator Dr. Jenny Doussan responded to the publication as an external voice. Cultural Threads considers contemporary artists and designers who work at the intersection of cultures and use textiles as their vehicle. Ideas about belonging to multiple cultures, which can result in a sense of connection to everywhere and nowhere, are more pertinent to society today than ever. So too are the layers of history – often overlooked – behind the objects that make up our material world. The publication closely mirrors many of the aims and interests of the Clothes, Cloth and Culture Group. 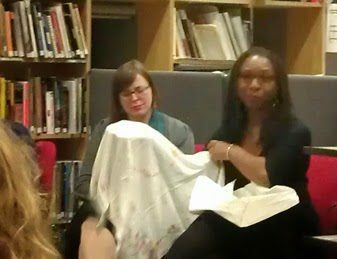 For example, in seeking to demystify postcolonial theory and show how it is embodied and articulated through textiles. 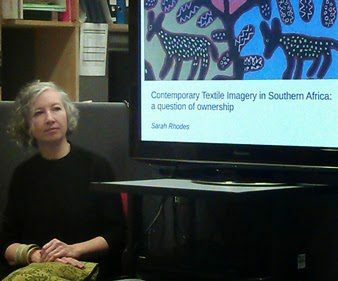 The emphasis on textiles as a record of lived experience also recalls the ‘conversationals’ or items of clothing or cloth that our presenters have used to introduce themselves and which exemplify their interest in and human connection to the subject.